Stratfor (via Forbes): Another version, hardly heard in the early days [of the Eurozone crisis] but far more credible today, is that the crisis is the result of Germany’s irresponsibility. Germany, the fourth-largest economy in the world, exports the equivalent of about 50 percent of its gross domestic product because German consumers cannot support its oversized industrial output. The result is that Germany survives on an export surge. For Germany, the European Union — with its free-trade zone, the euro and regulations in Brussels — is a means for maintaining exports. The loans German banks made to countries such as Greece after 2009 were designed to maintain demand for its exports. The Germans knew the debts could not be repaid, but they wanted to kick the can down the road and avoid dealing with the fact that their export addiction could not be maintained. The debate will also focus on the fact that Greece has done an amazing job in cutting its debt/GDP ratio - in spite of the falling GDP. Greek government bond yields spiked on Syriza's escalating rhetoric as well as on the right-wing anti-austerity party (Independent Greeks) becoming Syriza's new coalition partner. 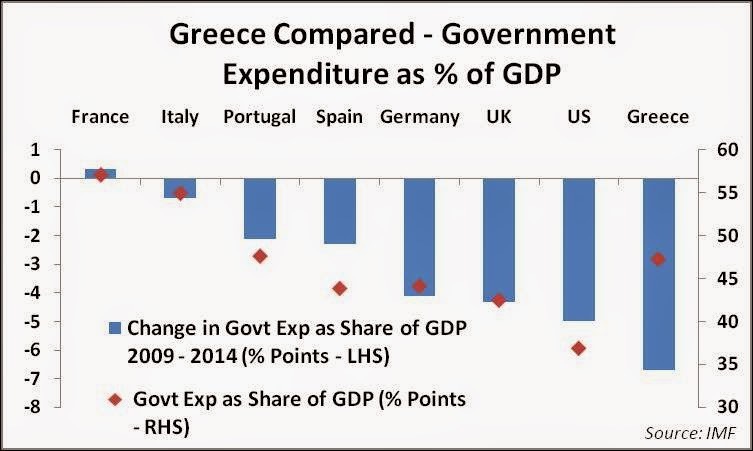 Think about it - the only thing the two parties have in common is their hatred for the Eurozone and the fiscal pain that was imposed on Greece. The Greek government bond yield curve has become more inverted as markets price in principal reductions that are likely to apply evenly across the curve (which is what typically causes such inversion). It is expected that if such haircuts are applied, they would hit both official and unofficial accounts (including bonds held by the ECB). Debt forgiveness would also cut principal on the government bonds held by Greek banks - who are some of the largest holders. That's why shares of Greek banks got decimated today. New bank bailouts will be required if there is any hope for credit availability to the private sector. For now most credit activity will come to a grinding halt - and with it any hopes for economic recovery. The overall equity market fell over 9% today as government officials halt privatization and extend an olive branch to Russia (see story). The newly elected government may ultimately get its debt forgiveness. But in the process the damage done to the nation's private sector will be severe - just as Greece begins to come out of a deep depression that rivals some of the worst downturns in global history.